Steeped in the artistic beauty and the human violence of a lost era that was defined by the Holocaust and years of brutal war, Django captivates with eccentricity and artistry that's mildly amplified by a feeling of loss and hardened repression. 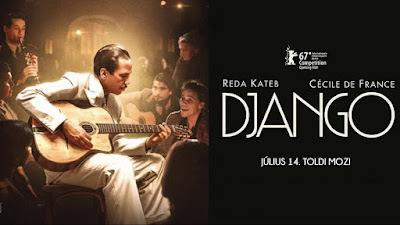 The 2017 film which tells of the jazz guitarist's later years and his escape from Nazi occupied Paris is a brooding tale that's distinctly replete with excellent costume design, beautiful sets that capture that world, and phenomenal musical numbers that will fascinate your ear drums. 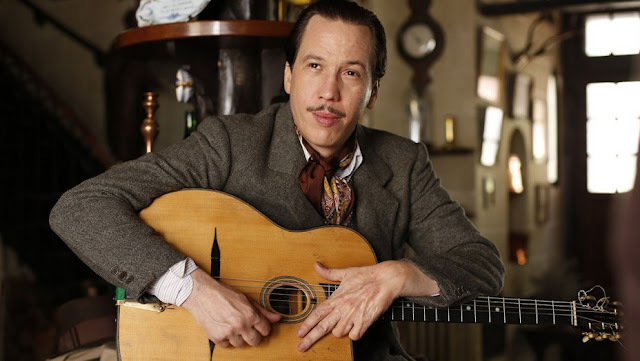 As a period piece, Django is a true testament to the talents of the guitarist that enlightens its audience with its historical lesson, but sadly falters by only giving us a brief study in the man's life. This film only offers us the years between 1943 to 1945 when Django was appreciated by all but stifled by the elements of war all around him. Django spends much of its time throwing the audience into a time machine, taking them back to claustrophobic jazz clubs, large theater performances, and dusty exteriors that show us the headstrong musician in his creative bubble, surrounded by those that adored and respected his works. Displaced by the German occupation, the untold gypsy lifestyle is finally transposed to film in a work that ultimately plays not just as a biographical lesson about Reinhardt but also shows the struggles of a people that were exposed to the ravages of the Fuhrer and the inhumane madness that ensued. Perhaps the hardest thing about this movie is the slow pacing which is purposeful but makes for a hard watch. Django is by no means a bad film. It just moves at a snail's pace, foregoing many typical biopic tropes for time encrusted aura that's topped by the frustration of knowing he never lived the full life he deserved. Eddie Van Halen has nothing on me. Music fans will definitely adore the proper respect paid to creating believable live music sequences and they'll absolutely enjoy the amount of detail in the creation of sets that seem like they're ripped directly from the '40s. A timeless lesson unfolds throughout Django that feels timely during the oppressive political climate we're experiencing right now. Yet, something is still missing from this project. There's not much back story. We're never privy to his upbringing or much about his introduction to the instrument which defined his life. Capping this at a two hour run time that dismisses much of what made him the transient but dedicated artist feels too truncated. With a minor script rewrite and some editing to show his earlier years, this could have been great. Being a lifelong lover of all things musical and artistic, Django is a bright spot at the end of 2017 that features wonderful performances all around. People that enjoy his jazz guitar style will most likely fall in love with this film. As much as I want to gush over this project, it felt like things were missing. Little details that would have pulled scenes together aren't quite there. And the absolute absence of his youth makes the final edit seem hard to fully connect to. This is an above average movie that just missed the mark of greatness.